When she’s all grown up, Miss Brooklyn will stand 62 stories high, with a glistening aluminum exterior. The lady is part of the $4 billion Atlantic Yards development project, a cluster of giant steel-and-glass buildings hundreds of feet tall, tiled with homogenous square windows, but carefully calculated to appear random. When completed in 2012, the building project in central Brooklyn, managed by the Forest City Ratner Companies, will include a boutique hotel, 6,430 condo units, and a pro basketball stadium. The thousands of Atlantic Yards residents will produce millions of gallons of sewage. Oozing from their garbage disposals and toilets it will flow down pipes, slither underground through South Brooklyn and–if it’s raining–deposit itself less than half a mile away in a hundred-year-old waterway called the Gowanus canal. The stagnant channel in the shadow of two large public housing projects–described by some as an “underwater junkyard”–is strewn with car parts, crumbling cement and, sometimes, raw sewage. When there’s heavy rain, sewage from overwhelmed drainage pipes rushes into the canal, flooding nearby homes with bacteria-laden wastewater. Residents have even reported 10-foot geysers of sewage. It’s a foul-smelling symptom of a problem that has long plagued central Brooklyn, where the combined storm water-sewage pipe system built more than a century ago now faces the demands of the hundreds of thousands of people living nearby. Many of those residents are worried that the massive Atlantic Yards project will worsen the situation, despite the developers’ promise to ease the impact by building water storage tanks and installing low-flush toilets. They say the city is backing down on its commitment to reduce sewage overflows in the neighborhood, and to create runoff-absorbing wetland areas that could serve as buffer zones along the fetid canal, a plan originally developed by the city along with the U.S. Army Corps of Engineers. “It’s really a matter of too many pipes going to one place and not enough being done by the [New York City] Department of Environmental Protection,” said Michael Ingui, chairman of Gowanus Community Development Corporation, a neighborhood improvement organization. When the Gowanus canal was completed in 1869, it was 100 feet wide, 12 feet deep, and 1.8 miles long. Local businessman Daniel Richards hit on the idea of expanding the naturally occurring Gowanus creek into a shipping canal, a lucrative opportunity to develop central Brooklyn. By 1890 the Gowanus canal was one of the most important waterways in the world. It was also one of the most polluted. As industry blossomed along the banks, water quality suffered. In 1911, the City of New York built a flushing tunnel, which propelled water from the East River into the canal, pushing the water and waste out to sea. But the tunnel’s propeller broke in 1960, ushering in a new era of industrial pollution in the waterway. Neighborhood residents called the channel “lavender lake” because an ink factory abutting the canal regularly flushed its tanks, tinting the Gowanus with whichever color ink it was manufacturing that week. Jean Austin, a real estate agent, has lived and worked in the neighborhood for nearly 25 years. She remembers smelling the canal from blocks away on certain days. “It was like an open sewer,” said Austin. In the last decade, canal cleanup has received more attention, thanks to pressure from community activists. The flushing tunnel was repaired in 1999 and water quality has steadily improved since, though the city government still classifies the channel as “non-contact”, its lowest rating, meaning no person should come in direct contact with the water. Many advocates note that even the repaired flushing tunnel does not always work and water in the Gowanus still sits stagnant on occasion. In 2003, the last time the city released data about the canal’s water quality, it found high levels of many bacteria often found in human waste, including infectious pathogens such as Staphylococcus and coliform bacteria. What worries Gowanus residents most are combined sewage overflows, or CSOs. Newer cities and suburbs have separate systems for sewage and storm water, but New York and other older cities have a combined system, most of which is more than a century old. When rainwater floods these pipes, the city authorizes a CSO, switching the system so that the sewage-laden runoff is dumped into the East River and the Gowanus canal. Unfortunately for the canal’s neighbors, this often causes wastewater to back up into nearby homes and businesses, flooding basements with feces. On average, this happens 53 times a year. “If it rains or is high tide, the whole canal will flood up the street,” said Marlene Donnelly, a member of a community organization called Friends of Greater Gowanus. Last August, when the CSOs were frequent, many children in the neighborhood, including Donnelly’s, came down with diarrhea, although a connection to CSOs was not medically established. 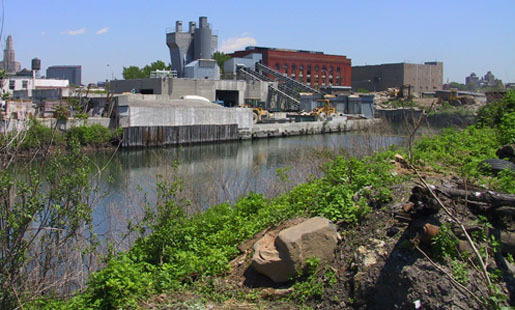 Neighborhood advocacy groups like Friends of Greater Gowanus pressured the city to repair the canal’s exit flows to reduce the number of CSOs. The city agreed, and planned to replace a corroded waste line moving sewage out of the canal, a step it said would reduce the number of CSOs by an estimated 20 percent by 2010. But with the Atlantic Yards development expected to produce around 1.1 million gallons of extra sewage and rain runoff, the city is now predicting that waste line repairs will only reduce CSOs by about four percent. While new pipes laid at the Atlantic Yard site will meet modern standards, the wastewater they contain will inevitably flow south, towards Gowanus, flowing into the same antiquated, narrow pipes that cannot handle the current volume. “We were anticipating a significant improvement, and now we’re looking at a slight improvement,” said Donnelly, whose home regularly floods with sewage. Hoping to address such concerns, Atlantic Yards developers plan to install water storage tanks that hold and release storm water slowly, along with recycled water irrigation and cooling systems, waterless urinals, low-flow toilets and showers, and wide plumbing pipes designed to meet modern standards. Loren Riegelhaupt, a Vice President at Forest City Ratner, says such low-flow technology will decrease waste volume in the pipes. Still, although water retention practices should reduce the wastewater volume flooding the canal during storms, they can’t reduce the amount of solid waste produced by residents, raising concerns that sewage overflows will become more concentrated. “The low flow plumbing and capture storm water tanks lead you to the conclusion that you’re going to have thicker sewage [that] could be more damaging,” said Mike Plumb, an intern at Columbia Law Clinic who helped prepare comments for Riverkeeper, an environmental advocacy group focused on water quality in New York. Despite the company’s claims that their green building practices will reduce the amount of water entering Brooklyn’s sewage infrastructure, many residents are unconvinced. “Don’t tell me there won’t be more coming into the system,” said Austin, who is concerned that the familiar sewage smell will soon return to her neighborhood. Forest City Ratner’s Atlantic Yards development is just one of a spate of construction projects going on in North and South Brooklyn, much to community activists’ chagrin. Given the size of the projects and Brooklyn’s already overtaxed infrastructure, it remains to be seen how citizens will be affected throughout New York’s most populous borough.